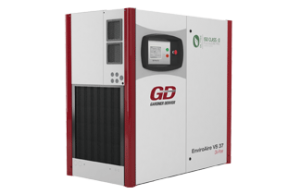 The 25 horsepower flooded fixed-speed rotary screw compressor is one of the newer ones that Gardner Denver has out there with a decibel level of about 70 dba or less, it’s very quiet. It works very well, it’s on a tank; it’s a compact unit that has a dryer hook with it and it’s more of a “plug and play” type of compressor. This being a flooded compressor means that the whole lubrication system is all done by oil process, where the oil is all circulated in around the air end and actually cools the air end down, then re-circulating back to the compressor where it just encloses the system on the oil. An oil-free compressor is a compressor that actually is what they now consider a “dry screw compressor.” It is a sealed bearing system on the air end, where the air end itself actually has zero oil inside of the air end. It has a water jacket that’s proprietary to Gardner Denver, a water jacket cooling system around the air end that keeps the actual rotors themselves cool. The air box is sealed from the rest of the air end rotors so that the air box actually does have a little bit of oil in it in the air case but it’s not anywhere exposed to the actual rotor. 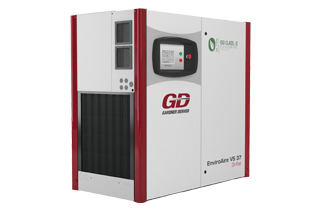 Oil-Free Compressors specific to Gardner Denver have what they call an oil-less compressor. Basically this is a completely sealed water system that actually cools the air end and the rest of the compressor down and there isn’t one bit of oil in the compressor. It’s kind of unique to its industry.